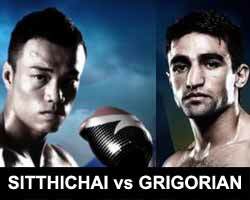 Review by AllTheBestFights.com: 2015-12-19, good fight between Sittichai Sitsongpeenong and Marat Grigorian: it gets three stars. The 2014 Lumpinee Ww champion Sitthichai Sitsongpeenong entered this fight with a professional kickboxing record of 103-29-6 and he is ranked as the No.3 super welterweight in the world. He has already fought eleven times in 2015 losing twice: against Dylan Salvador in May (via split decision) and Robin van Roosmalen in his last fight in November (valid for the Glory Lw title, Roosmalen vs Sittichai). His opponent, Marat Grigorian, has an official record of 44-7-1 (25 knockouts) and he entered as the No.8 in the same weight class. He has also lost twice in 2015 (fighting eight times): against Yodsanklai Fairtex in April (who was scheduled to fight Sittichai in the original fight card of Kunlun 35, Yodsanklai vs Grigorian) and Sergey Adamchuk in June; after this bout he has won three times beating Jordann Pikeur in his last one (final of the K-1 World GP tournament Grigorian vs Pikeur). Sitthichai vs Grigorian, main event of Kunlun Fight 35, is the quarterfinal of the Kunlun middleweight championship tournament. Watch the video and rate this fight!